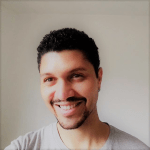 Hi, my name is Daniel, a qualified portuguese teacher and pedagogue. I'm Brazilian and currently I live in Italy where I'm working as a portuguese teacher. I've been teaching for the past 7 years, with private lesson both presential and online. I adopt a communicative approach, so in my lessons we will speak a lot for practice the language structures. But also, leaving from the analysis of proposed materials, we will extrapolate grammar rules. So it won't be a useless chat, but each speaking will have a clear didactic purpose. We will practice with a lot of exercises, then we'll correct them together to fix the new contents . I will apply teaching methods and the most recent pedagogic techniques (mental maps, multiple intelligence teory,...) for help you to memorize and learn faster. In our first lesson we will talk about your goals and needs, I will detect yout level of portuguese (speaking and with a little written test), so that the following lessons will be designed on you. I like to create a good and anxiety-free atmosphere tha help the acquisition process. Don't worry if you are a beginner. I'm very patient and love what I do. Setting up goals, analysing the students’ backgrounds and institutional environments, content and method, learning processes and evaluation, project work, case work and different kinds of group work. Private presential and online lessons of Portuguese for Exams of proficiency: -design and customize lesson according to student level, interests and needs;-motivate and follow the student in his growth path; -look for and choose authentic didactic materials. My duties included assist 4-5 years-old children initial notion of formal and social life skills.